Grew Up… in a middle class family with his father, Carl Fox, a hard-working and principled mechanic who became the union leader of the workers at Bluestar Airlines. Living… in a studio apartment in Manhattan in the1980’s. He makes $50K a year (about $110K today with inflation), but that doesn’t go very far when you’re determined to be a player on Wall Street. After his rent, school loans, and the money he spends on his power suits and expensive dinners, he doesn’t have much left. He jokes that American Express has a hit man looking for him. Profession… banker. He has just started working at a brokerage firm called Jackson Steinem & Co. Bud is a stockbroker, which isn’t as glorious as it sounds. He’s constantly making phone calls, trying to sell anything he can to individual investors. Interests… money and all the women, glamour, and power that come with it. 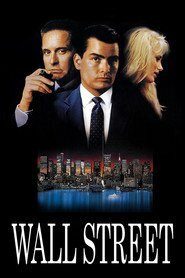 Relationship Status… single for now but he’s recently proposed marriage to the assistant of Gordon Gekko, a legend in the financial world. Bud has cold called him so many times (at least over 39 times), he has developed quite a relationship with his assistant named Carolyn. Though Bud is really just a flirt and will say anything to get the meeting. Challenge… sealing the deal. Gordon Gekko has finally agreed to meet with Bud. Hearing that it was his birthday, Bud has arrived at his office with a box of Havana cigars from Davidoff's in London. As Bud says, "Life all comes down to a few moments. This is one of them." Bud has only a few minutes to impress Gordon with his stock ideas. Personality… ambitious and smart yet impatient and cocky. Bud has no time for slow pay-raises and conventional ladder climbing. If he’s going to be in the game, he’s going to be at the top – no questions asked! Bud Fox's popularity ranking on CharacTour is #4955 out of 5,000+ characters. See our top-ranked characters and read their profiles.